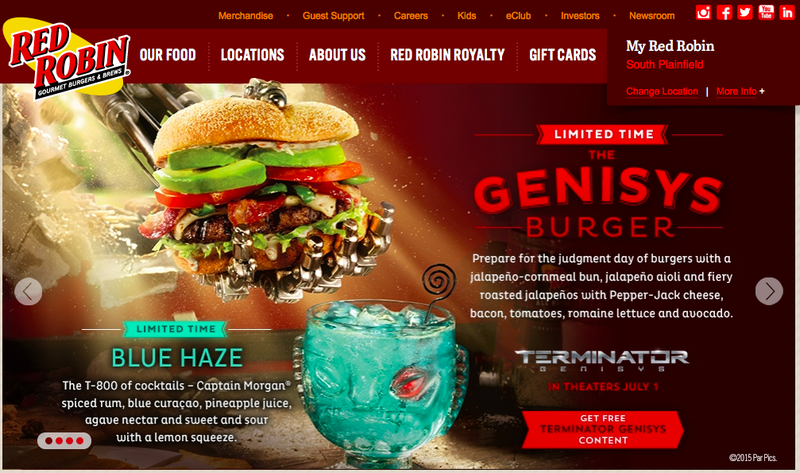 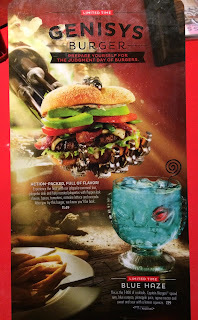 I found that a restaurant chain Red Robin has launched a special burger called "The Genisys Burger" featuring "Terminator Genisys" on June 15, 2015. We called a restaurant to make sure they have the burger, and last night, we tried both The Genisys Burger and Blue Haze, a special T-800 cocktail, even though I rarely drink. 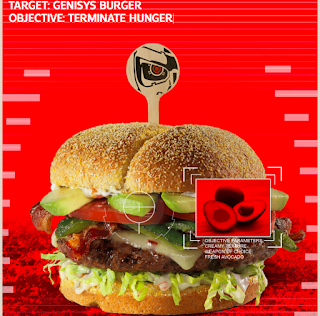 HP had a special feature and when I paced the tip of cursor on the burger, ingredients appeared. When I placed the cursor on avocados, a cut and whole avocado appeared in a red square with the following line as if Terminator was calculating the item. 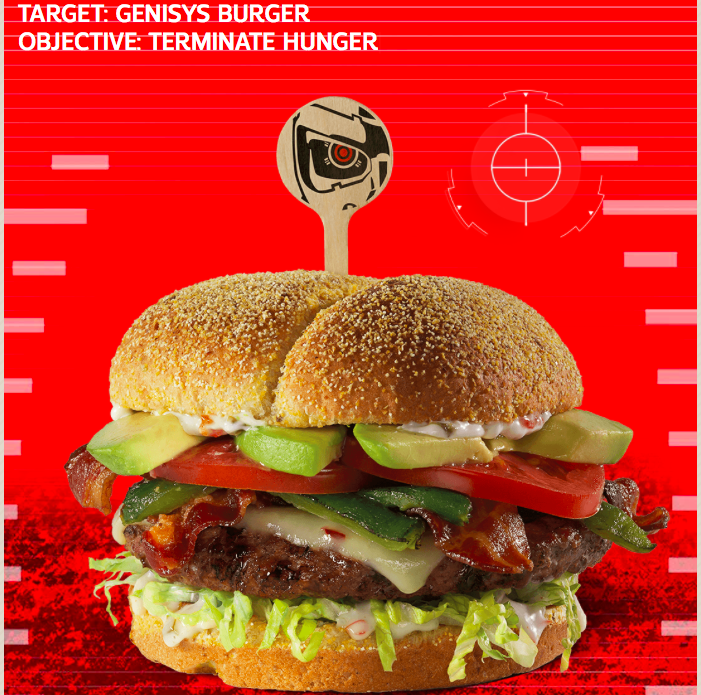 The Genisys Burger consists of a jalapeño-cornmeal bun, jalapeño aioli, fiery roasted jalapeños, Pepper Jack cheese, bacon, tomatoes, romaine lettuce and avocado. 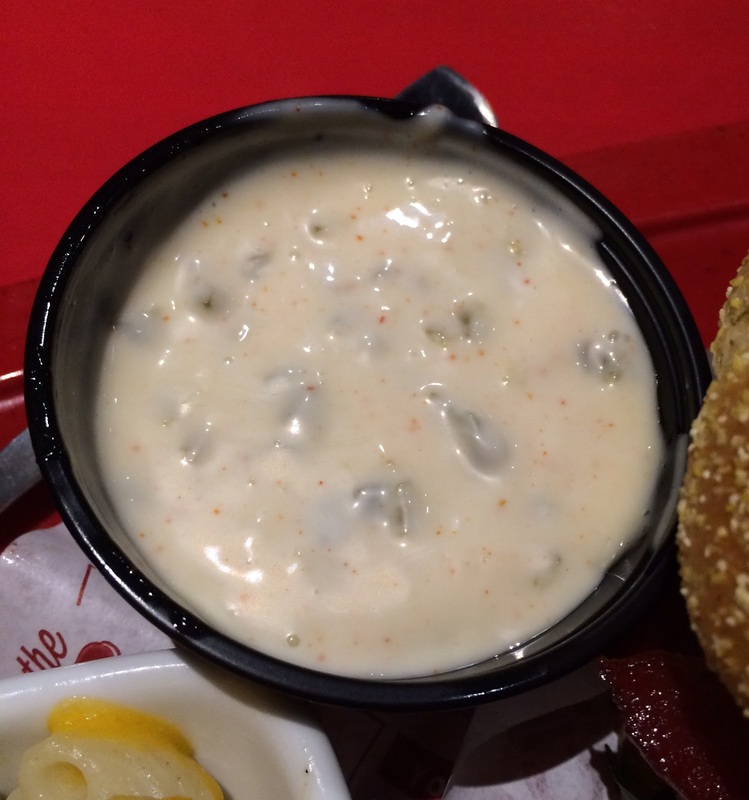 I was afraid the aioli would have strong mayo flavor, so I asked to put it on the side. 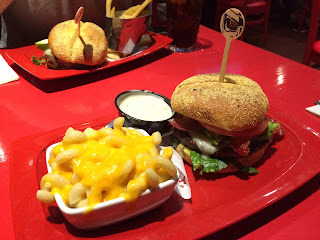 It comes with fries, but I upgraded and substituted with Mac & Cheese. 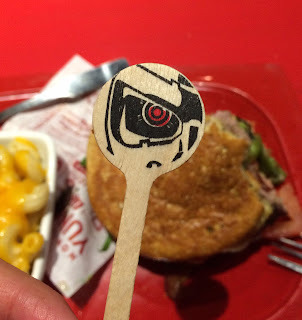 We had a little hope that they'd actually put a wooden stick with the red eye of Terminator, but they sure did. 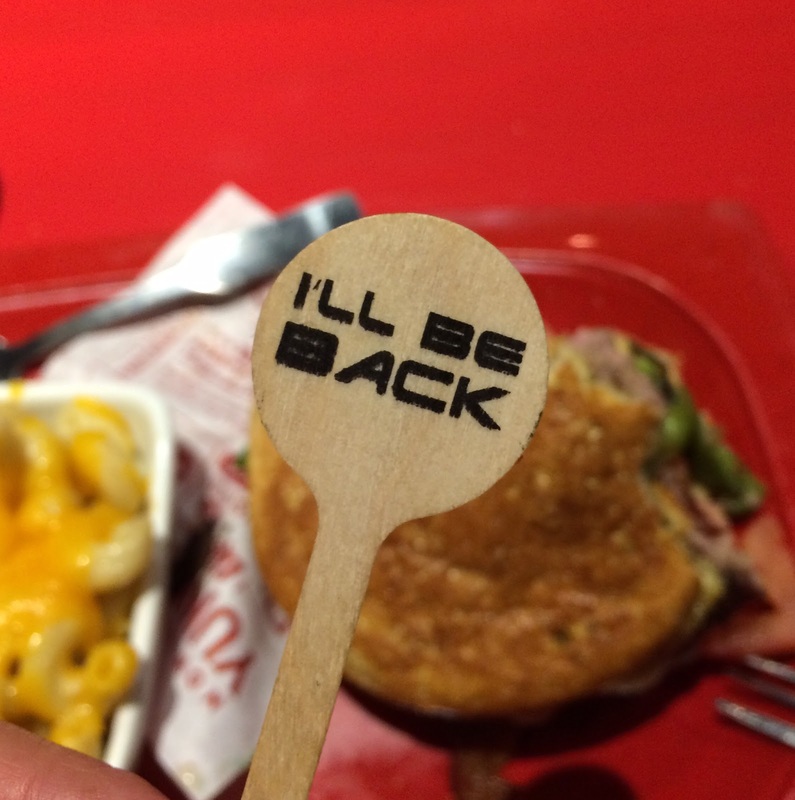 "I'll be back," on the back side. 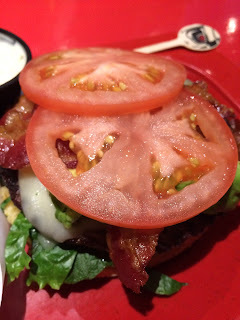 Underneath the bun, there're 2 slices of tomato. 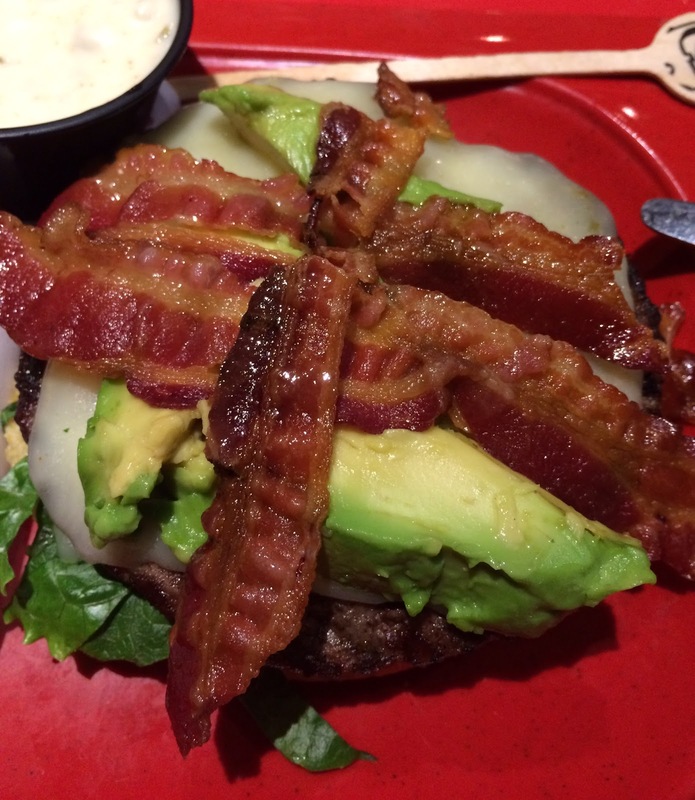 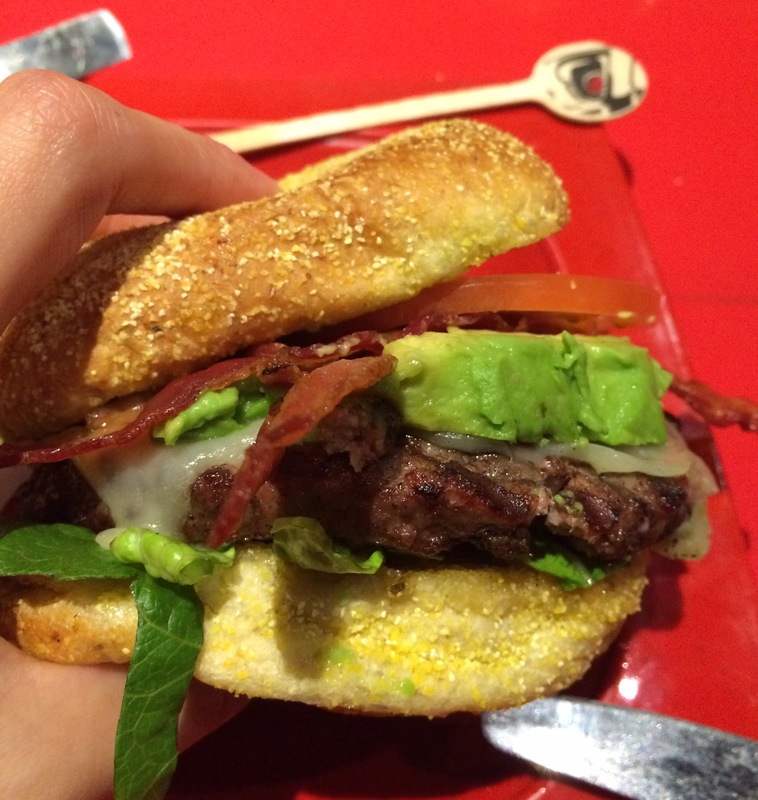 Then 3 bacon strips, avocado slices, a patty with melted cheese and shredded lettuce. 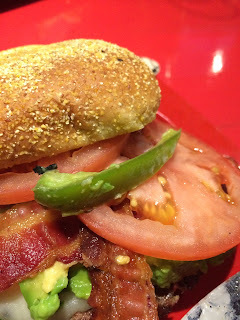 I didn't see any roasted jalapeño, so I got some from my husband's burger. 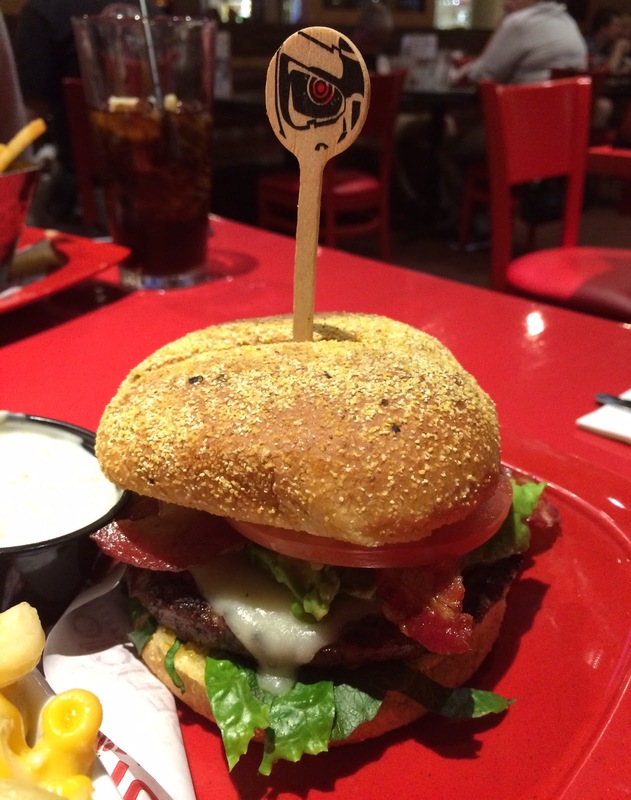 As you can see, the burger was quite heavy and tall. 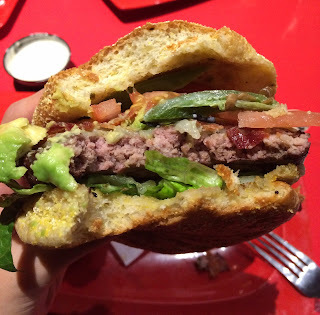 The patty was cooked medium as I requested, and the buns were fluffy. The top was covered with cornmeal, but I didn't taste any jalapeño in the buns. The patty wasn't that juicy but not dried, so it's just ok. Tomatoes and lettuce added refreshens, avocado was creamy, jalapeño that I got from my husband was spicy but had some sweetness as it's roasted, and bacon strips were very crispy, that I really like. It's tasty as it was and I ate the whole burger though it's large. 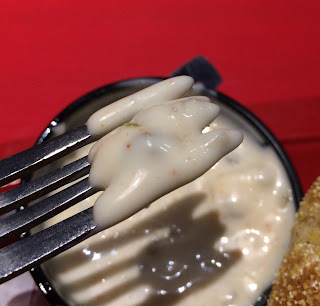 Jalapeño aioli smelled like mayonnaise. There's some diced jalapeño in the sauce, but it didn't help to reduce mayo taste and I didn't use this sauce. 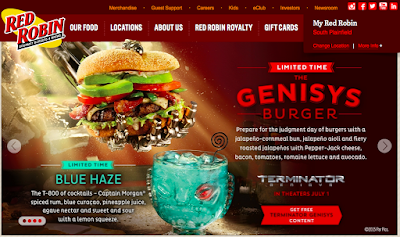 Other reviews of Red Robin.